Too often the passing of one’s family, spouse, or friends brings with it the reality of our own mortality. ?Why? ?It can be an unsettling question at best. ?Its finality can be daunting. ? Some find comfort in God; others, in medicine. ?Yet it is people who most touch those ?bereaving. 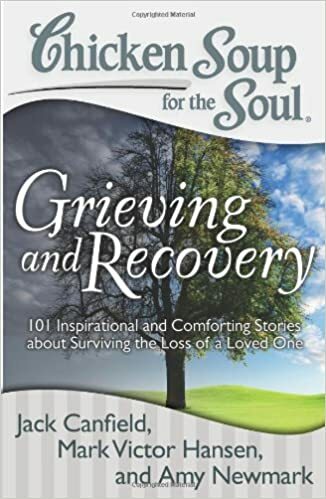 101 of their stories are told in?Chicken Soup for the Soul: Grieving and Recovery. I found these personal non-fiction accounts of how others cope with death inspirational and comforting. ? Mourning has its time and place, but ?mourning the dampers the quality of life for the survivors is a double loss. ?Knowing one is not alone makes what is difficult, often painful more bearable to face. Sharing stories about surviving the loss of a loved one ?are brief common sense. ?Its contents touch realities including?making the most of memories, finding comfort, helping hands. attitude adjustments, at the end, moving forward, across the generations, new beginnings, healing time, and signs from beyond often brings closure ?followed in time with new beginnings. In reading Grieving and Recovery, the obvious was no longer obscure. ?I found real truths in Beverly Walker’s poem?”How to Help,” Susan Palmquist’s “A Call to Action,” and Claire Mix’s “Grieve Bee”. Peace and coming to terms with death is different for each person touched by it. ? Let yourself grieve. ? It may take time for life to go on. ?Loss change us.